Restarants.com brought a “Dish Mobbed” Event and Dine Local Movement to Orlando Area. On February 20th, I went to Casey’s Sports Bar and Grill, (1335 Tuskawilla Rd. Winter Springs, FL), where the "dish mob" event was being held. The Orlando Dish Mobs event was part of a nationwide movement organized by Restaurant.com and local community members and organizations to inspire residents to dine out and boost business at local, independently-owned restaurants. A small group of female bloggers was seated at a table with several dishes from the restaurant. A news anchor, Mike Holfeld, from Channel 6 News was interviewing participants. He conducted several interviews with representatives from Restaurant.com as well as bloggers. I didn't see the news that night to see the news story. The only item I tried was a coconut crusted shrimp. It was decent but it wouldn't inspire me to make the drive out to Tuskawilla a second time. Each year, Restaurant.com helps to fill nearly 5.5 million tables at independently owned restaurants nationwide. To further the company’s mission to support businesses at the local level, Restaurant.com is launching the second, Dine Local Dish Mobs campaign – an effort to further encourage diners to dine local at independently owned restaurants in their communities from February 20th through March 1st. 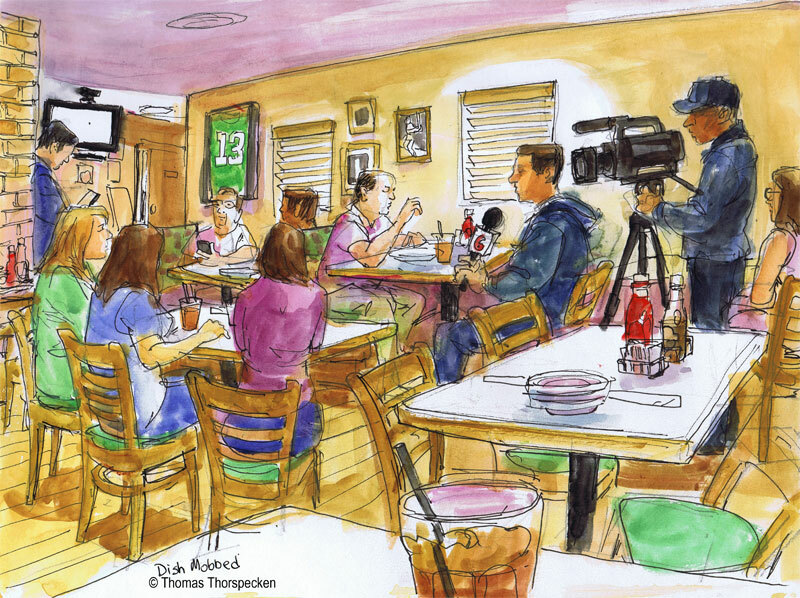 After the TV news crew left, the restaurant started filling up for the noon rush. Buzzing on several cup of Coke, I finished the drawing and made my way back home. Rather than a "Mob" this felt like a small coffee clutch, but I like the "Eat Local" mission statement. Ironically this family owned restaurant was right next to a McDonald's.